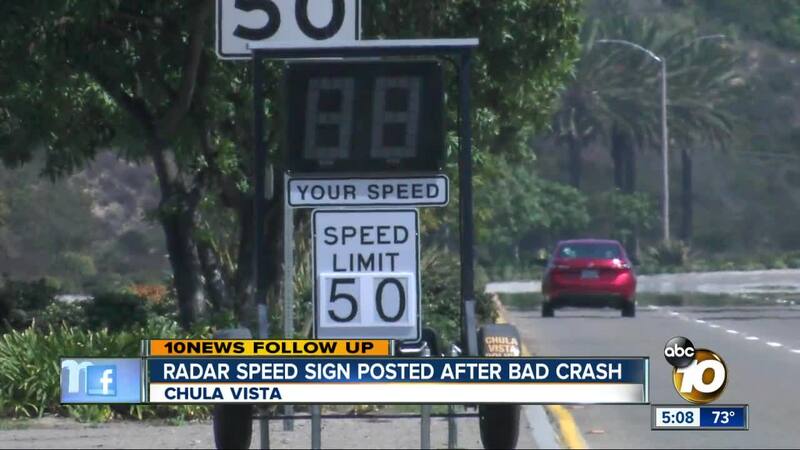 CHULA VISTA, Calif. (KGTV) — A crash this past weekend sparked concern for South Bay drivers traveling on Olympic Parkway. After a number of calls to the Chula Vista Police Department from 10News, small improvements have been made to keep drivers safe. A radar speed sign now sits in the median of Olympic Parkway between Brandywine Avenue and Heritage Road. Neighbor Luis Acosta tells us he works as an Uber driver and spends a lot of time on the road. “People tend to speed up on Olympic Parkway, that’s definitely an issue,” says Acosta. The radar sign appeared after a number of crashes in the area. The most recent crash was Sunday, where a teen lost control of the car and hit a pole. The long stretch of road between Brandywine Avenue and Heritage Road have now street lights or stop signs. Acosta says he doesn’t blame the city of Chula Vista or the police department for the crashes or speeding drivers. “I think they’re doing their job, the community just needs to be responsible and not speed," Acosta said. 10News reached out to the traffic division of the Chula Vista Police Department to find out if they are increasing patrols or doing more in the area to decrease speeds. We are still waiting to hear back.